Using a small heart-shaped cookie cutter, cut several hearts out of the melon strips. 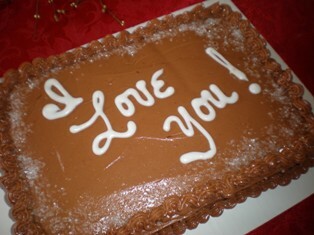 Place the desired number of hearts on each plate. Cut the prosciutto slices in half lengthwise. Starting from the short end, gently roll each slice, like a jelly-roll. The edge of the prosciutto with the strip of fat will be the top of each rose. Stand each roll upright on the plate. Slightly flare the top edges open to simulate the petals of a rose. 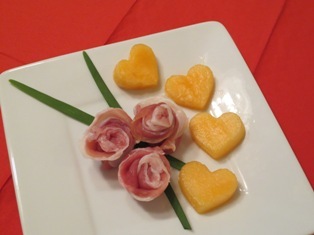 Place the desired amount of prosciutto roses on each plate among the melon hearts. Serve at room temperature. 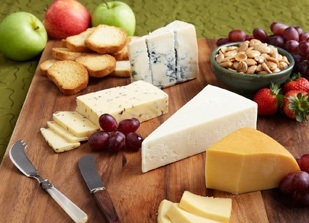 Sharing fondue can be an intimate affair for two or a festive get-together for a group of friends. Mainly, fondue is a sharing experience. We have provided a few suggestions for dipping items but you can choose just about anything you like or have in your refrigerator. Place 1 cup hot water in a small bowl with the dried mushrooms. Let stand until mushrooms are soft, about 25 minutes. Remove the mushrooms from the water and finely chop them. Strain the soaking water through a fine sieve into a large skillet. Add garlic and mushrooms. Simmer over medium heat about 4 minutes or until almost all liquid is absorbed. Season with salt and pepper. Mix 1 tablespoon cornstarch and 1 tablespoon water in a small bowl. 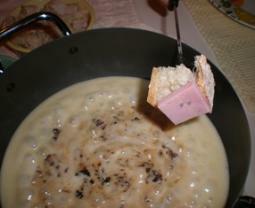 Add wine to the fondue pot and bring to a simmer over medium-high heat. Add cheese by handfuls, stirring until melted. Add cornstarch mixture. Bring to a simmer. Stir until fondue thickens slightly and begins to bubble, about 2 minutes. Season to taste. Swirl in porcini mushrooms. Serve with bread and dippers. Divide oysters between 2 buttered ramekins, keeping the oysters in 1 layer. In a skillet, melt the butter and sauté the garlic and breadcrumbs until crisp and lightly golden. Top the oysters with the breadcrumbs and sprinkle with cheese. Bake in top 1/3 of oven for 12-15 minutes until browned and bubbly. Serve with lemon wedges. Parmesan Palmiers can be made ahead and then sliced and baked right before seriving. 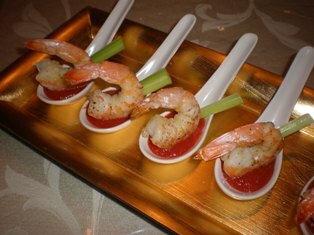 They are a nice accompaniment to a glass of wine or champagne or served alongside a soup or salad. Have a plate of palmiers to munch on before dinner or with an antipasto platter. Thaw and unfold both sheets of puff pastry. Sheets should be approximately 10 x 10-inches. In a small bowl, combine the cheese, mustard, cayenne, and black pepper. Spread 1/2 cup over the cheese mixture over each puff pastry sheet. With the palms of your hands, press the cheese onto the dough. Starting from one side, lightly roll up the dough, stopping at the midpoint of the sheet. Roll up the opposite side in the same way, so that the 2 rolls meet in the center. Repeat with the other pastry sheet. Wrap each roll and refrigerate until firm, about 1 hour. Cut off and discard a thin slice from each end to form an even edge. Cut into 1/2-inch thick slices. Arrange the palmiers 2-inches apart on the prepared baking sheets. Sprinkle the tops with the remaining 1/4 cup of grated cheese. Bake until cheese melts and pastry is crisp and golden, 12 to 15 minutes. Transfer the palmiers to a wire rack to cool. 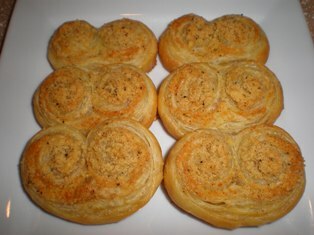 Parmesan Palmiers are best served the same day but can be stored for a day or two. 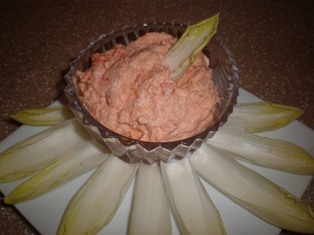 Smoked salmon mousse with endive is a classic appetizer. Put a new twist on it by serving the mousse with potato chips or pita chips. Chop half of the smoked salmon and set aside. In a blender or food processor, blend the remaining smoked salmon with 1/4 cup of cream. Transfer the mixture to a large bowl. In the same blender or food processor, blend the canned salmon with 1/4 cup of cream. Add the mixture to the smoked salmon in the bowl; stir in pepper. In a small bowl, beat the remaining 1/2 cup cream until stiff peaks form. Fold the whipped cream and reserved chopped salmon into the salmon mixture in the bowl. Spoon mousse into a serving bowl. Cover and refrigerate 2 hours or until well chilled. Separate endives into leaves. Place bowl with mousse on a platter surrounded by endive leaves. Garnish top of mousse with caviar. To serve, spoon a dollop of mousse with some caviar at the wide end of endive leaf. Pick up leaves at pointed end to eat. BROWNIES: Cut the hearts after baking the brownies. Coat the cookie cutter with non-stick spray between cuts.